July 9, 2018: Last month, flight attendants got some bad news. According to a new study from researchers at Harvard University, the crews of commercial airlines face an elevated risk of cancer compared to members of the general population. The likely reason: cosmic rays. High energy particles from space hitting the top of Earth’s atmosphere create a spray of secondary radiation that penetrates the walls of airplanes above ~20,000 feet. 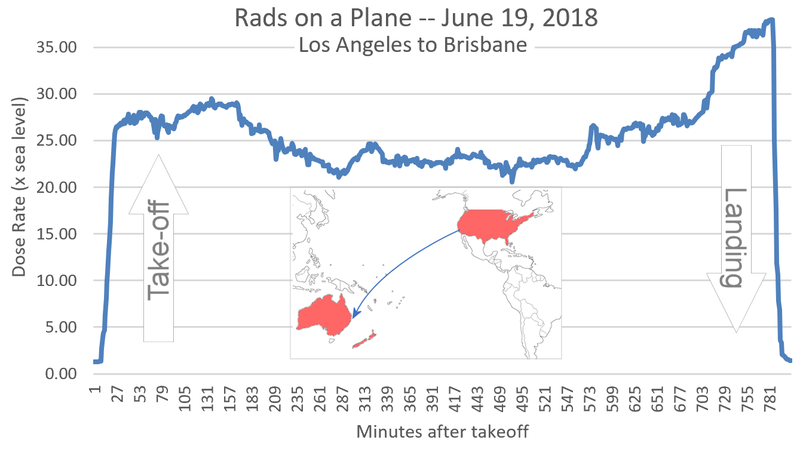 Within minutes after takeoff from Los Angeles, radiation in the passenger compartment multiplied 25-fold and remained high until we landed again in Brisbane 13 hours later. Peak dose rates were almost 40 times greater than on the ground below. In total, we absorbed a whole body dose approximately equal to a panoramic dental X-ray. Our sensors measure three types of radiation: neutrons, X-rays and gamma-rays. Using bubble chambers, we found that about 1/3rd of our exposure came from neutrons. Each bubble pictured above is formed by an energetic neutron (200 keV – 15 MeV) passing through the chamber. Counting bubbles yields the total dose–about 8 uGy (micro-greys) of neutrons during the entire flight. Adding it all together, we detected about 24.3 uGy of neutrons + X-rays + gamma rays during the Los Angeles to Brisbane leg of our flight. For comparison, a panoramic dental X-ray yields between 14 uGy and 24 uGy. Now for more bad news. Cosmic rays at aviation altitudes are a cocktail of different things: e.g., neutrons, protons, pions, electrons, X-rays, and gamma rays spanning a wide range of energies. Our sensors sample only three ingredients of that cocktail (neutrons, X-rays, gamma-rays) at relatively low energies typical of medical X-rays and airport security devices. This means our data are only the tip of the iceberg. Flight crews and passengers absorb even more radiation than we can detect. What we didn’t expect was the difference in neutrons: During our Arctic flight, neutron radiation made up fully half of our dose. During our equatorial flight, neutrons amounted to only 1/3rd. In other words, the cocktail changed. These are potentially important differences because neutrons are a biologically effective form of radiation of keen interest to cancer researchers. Stay tuned for updates as we continue to process our haul of data from 5 plane flights and 3 balloon flights in New Zealand.